Eclipse: Skywyre Primitive Edition is a primitive version of the engine I've built for my personal projects over the last few years. No, the Engine doesn't have all of the features that my project has, but it is very stable and still feature-packed enough to make a game with right out of the box. Please note that, if you are going to be using this Engine, you must credit me. The Engine features a clean DX8 UI, combat modifications, a bug-free expansive feature list, a stable base, new admin features, a clean menuized admin panel, and much more. Without further delay, here is the feature list. Do keep in mind that I'm going off of memory, so I may keep out some features from this list. Now you can create classic ice slides from games like Pokemon. Without needing VB6 you can now customize what classes advance to what. You can spin in place by using the PgUp and PgDn keys. Basic crafting with the use of Recipe Items and Crafting Tools. Must be in a Crafting Zone to craft. This Day/Night Cycle is dynamic and looks great. Day slowly turns to Night and blocks out view. NPC's can be set to spawn at Only Day or Only Night, leading to dynamic NPC spawns. You can set maps to Day Always or Night Always for buildings and caves respectively. A new tile attribute. This will show a Light on the screen that flickers. Color is customizable from the Attribute Editor. Alatar's Quest System with the ability to give Quests from Events. Scott's Guild System with working Guild Tag Colors. Dynamic Projectiles with new Triangulation Collision Detection. Ammo included as an optional feature. Spells can level up if set to in the Spell Editor. Choose from the Spell Editor which stat the Spell's vitals will scale from. My stealth system. Renders you semi-transparent on your screen, while you are completely invisible to other players and enemy AI. New spell type: Blind. Renders a completely solid black tint on your screen for the duration. All attacks will miss during this time. Npcs will select a random spell from it's list and use that spell's cast and cooldown times. Npcs can now launch projectiles at you. You can now select a unique attack speed for each Npc. Select a movement speed for each Npc. Npcs can drop more than one item with varied percentage based chances. Selecting this will then announce globally when a player has killed the boss and in what map. Items and Npcs can now have an element assigned to them. Each element has strengths and weaknesses to the others. Items can now offer real Defense to players. Items can now have an assigned tool power. If it is below the required tool power designated to harvest a resource, one cannot gather it. Gathering resources can now garner EXP. Will un-equip a shield if equipped. Now has a higher damage ratio than 1 Handed weapons. Selecting this option will make that projectile weapon scale off of Int rather than Agi. Items can now have an assigned weight. If you are carrying more weight than you have Stamina, you cannot run. Use of this item will reset a player's stats. Upon reaching Level 25 a player will be given a choice of a class to advance to. Currently hard-coded. Editor for this coming soon. You can restrict multiple classes from using an item. You can now tint items and Npcs. Maps can have weather effects on them. Maps can have a fog on them. Map Report now opens a form which lists all maps. You can warp to any map from here. Heal Tiles will now heal over time. Maps only accessible to players in a Party. Heal, Kill, Visibility, ECT are now available to the Admin. Pretty nice and clean. You'll see when you use it. Press the H key to hide the GUI. Autotiles, Animated Tiles, Waterfall Tiles, Cliff Autotiles, all in VX format. As far as I can tell, no bugs! 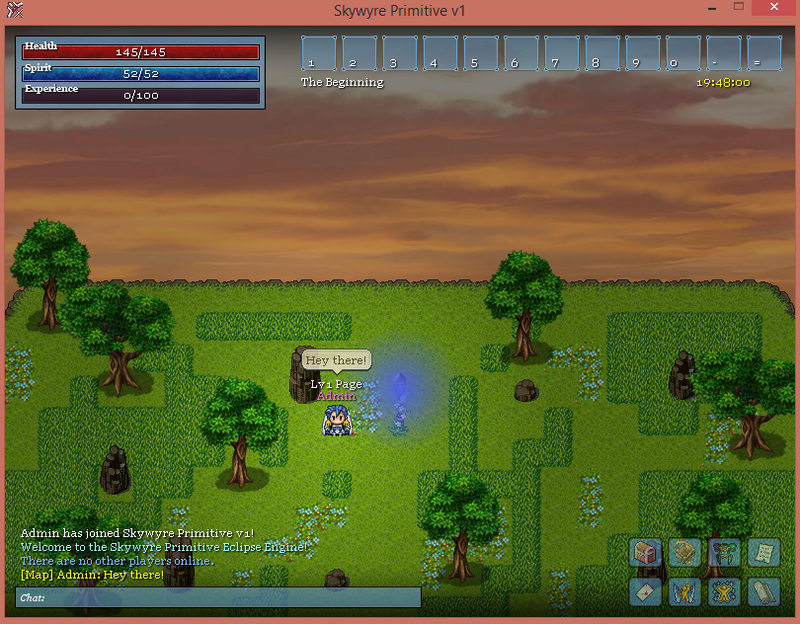 I also shipped this with the GUI I had initially designed for Skywardens but am having it redone later. Feel free to use it, but you must credit me. To promote Eclipse Skywyre 2D ORPG Maker and grow its popularity (top engines), use the embed code provided on your homepage, blog, forums and elsewhere you desire. Or try our widget.